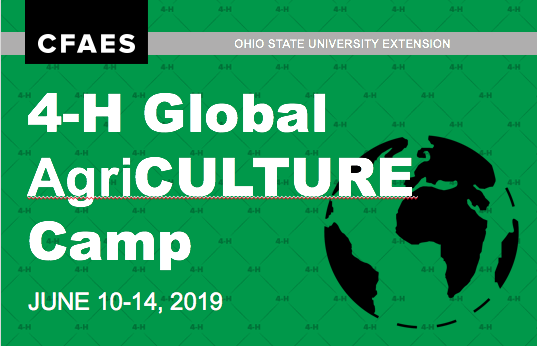 The 4-H Global AgriCULTURE Camp is a new statewide camp designed to help teens (entering grades 8, 9 and 10 in fall 2019) decipher the daunting issues of hunger and poverty, and create commitments to local actions. The camp will commence with expert presentations and activities to help youth understand the complexities of food insecurity. Activities include exercises from a new global 4-H project book and hunger and poverty simulations. Youth will visit laboratories and demonstration plots around Ohio State University's Columbus campus to examine multi-disciplinary ideas, along with volunteering at the Mid-Ohio Foodbank. The event will culminate with a trip to the Heifer Global Village in Michigan for an overnight stay to better understand global perspectives of food insecurity and poverty. Campers will leave with a community service plan and the opportunity to extend their learning by participating in the Ohio Youth Institute of the World Food Prize. Download a flyer about the camp.